Adoration (Latin adoratio) is respect, reverence, strong admiration or devotion. The term comes from the Latin adōrātiō, meaning to give homage or worship to someone or something. 1.2 Blessed Mother Teresa gives 22 reasons to sign up for a Holy Hour of Eucharistic Adoration! Baruch Spinoza: Those who wish to seek out the cause of miracles and to understand the things of nature as philosophers, and not to stare at them in astonishment like fools, are soon considered heretical and impious, and proclaimed as such by those whom the mob adores as the interpreters of nature and the gods. This adoration of Mr Gandhi became so widespread and so vehement, that people all over India in villages tried to worship him like a god wherever he moved there. Mahendra Narayan Behera, in Brownstudy on Heathenland: A Book on Indology (1 January 2003, p. 160. ADORE, v.t. To venerate expectantly. Shirley Temple Black, in A Patchwork Sampler (2010), p. 268. Albert Camus, in Memorable Quotations: Philosophers of Western Civilization 01-Jan-2000, p. 47 Carol A. Dingle. Michael J. Fox (2000), in Michael J. Fox A Biography , p. 51. Jaron Lanier, in Authenticity: Brands, Fakes, Spin and the Lust for Real Life, (2003), p. 178. People who do not love themselves can adore others, because adoration is making someone else big and ourselves small. They can desire others, because desire comes out of sense of inner incompleteness, which demands to be filled. But they can not love others, because love is an affirmation of the living growing being in all of us. If you don’t have it, you can’t give it. Teaism is a cult founded on the adoration of the beautiful among the sordid facts of everyday existence. It inculcates purity and harmony, the mystery of mutual charity, the romanticism of social order. Kakuzo Okakura, in Green Gold: The Empire of Tea (30 November 2011), p. 64. Imitation is the greatest form of adoration. Jayce O'Neal, in Deadly! Deadly Serious Comedy and Comical Calamity (23 September 2011), p. 239. I adore the way he looks at me sometimes, as if love is a quantity he cannot measure scientifically, because it multiplies too quickly. What did you expect when you unbound the gag that muted those black mouths? That they would chant your praises? Did you think that when these heads that out fathers had forcibly bowed down to the ground were raised again, you would find adoration in their eyes? Jean-Paul Satre, in Memorable Quotations: Philosophers of Western Civilization 01-Jan-2000”, p. 197. Those who wish to seek out the cause of miracles and to understand the things of nature as philosophers, and not to stare at them in astonishment like fools, are soon considered heretical and impious, and proclaimed as such by those whom the mob adores as the interpreters of nature and the gods. Baruch Spinoza, in The Bold Truth (1 January 1997), p. 266. Adoration is caring for God above all else. Charity is the outward swing of prayer towards all the world...embracing and caring for all worldly interests in God’s name. 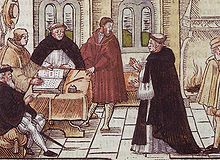 Martin Luther:To gather with God's people in united adoration of the Father is as necessary to the Christian life as prayer. Lucinda Franks, in Seize the Moment (19 April 2011), p. 23. Martin Luther, in Walking with God: Spirituality in the Postmodern Era (2008), p. 136. 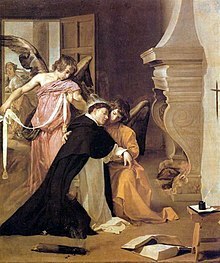 St. Thomas Aquinas:Adoration, which is known as latria, in classical theology, is the worship and homage that is rightly offered to God alone. It is the manifestation of submission and acknowledgement of dependence appropriately shown towards the excellence of an uncreated divine person and to his absolue Lordship. It is the worship of the Creator that God alone deserves. Mark I. Miravalle (2006), in Introduction to Mary: The Heart of Marian Doctrine and Devotion, p. 13. Adoration, which is known as latria, in classical theology, is the worship and homage that is rightly offered to God alone. It is the manifestation of submission and acknowledgement of dependence appropriately shown towards the excellence of an uncreated divine person and to his absolue Lordship. It is the worship of the Creator that God alone deserves. St. Thomas Aquinas, in "Introduction to Mary: The Heart of Marian Doctrine and Devotion", p. 13. Although we see in English a broader usage of the word “adoration” which may not refer to a form of worship exclusive to God—for example, when a husband says that he “adores his wife”—in general it can be maintained that adoration is the best English denotation for the worship of latria. Veneration, known as dulia in classical theology, is the honor and reverence appropriately due to the excellence of a created person. Excellence exhibited by created beings likewise deserves recognition and honor. We see a general example of veneration in events like the awarding of academic awards for excellence in school, or the awarding of Olympic medals for excellence in sports. There is nothing contrary to the proper adoration of God when we offer the appropriate honor and recognition that created persons deserve based on achievement in excellence. We must make a further clarification regarding the use of the term “worship” in relation to the categories of adoration and veneration. Historically, schools of theology have used the term “worship” as a general term which included both adoration and veneration. They would distinguish between “worship of adoration” and “worship of veneration.” The word “worship” (in a similar way to how the liturgical term “cult” is traditionally used) was not synonymous with adoration, but could be used to introduce either adoration or veneration. Hence Catholic sources will sometimes use the term “worship” not to indicate adoration, but only the worship of veneration given to Mary and the saints. Confusion over the use of the term worship has led to the misunderstanding by some that Catholics offer adoration to Mary in a type of “Mariolatry,” or idol worship given to Mary. Adoration of Mary is a grave rejection of Christian revelation and has never been nor will never be part of authentic Catholic faith and life. 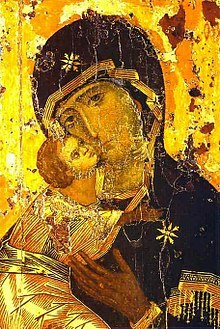 Dr. Mark Miravalle, in "What Is Devotion to Mary? (24 November 2006]". The Blessed Virgin rightly receives a singular and unique place of special devotion in the Church which is higher than that of the saints and angels, but always humbly below the adoration due to God alone. Adoration whereby we adore God is an act of religion. St Thomas Aquinas (2013), in Summa Theologica, Volume 3 (Part II, Second Section), p. 1547. Blessed Mother Teresa gives 22 reasons to sign up for a Holy Hour of Eucharistic Adoration! Christ with the Eucharist, Vicente Juan Masip, 16th century. Saints Adoration Quotes - Page 1 Blessed Mother Teresa gives 22 reasons to sign up for a Holy Hour of Eucharistic Adoration! Every Holy Hour we make so pleases the Heart of Jesus that it will be recorded in Heaven and retold for all eternity. It opens up the floodgates of God’s merciful Love upon the world. Adoration of the Blessed Sacrament is the best time you will spend on earth. It will make your soul everlastingly more glorious and beautiful in Heaven. A Holy Hour of adoration helps bring everlasting peace to earth. It brings us personal peace and strength. It brings us a greater love for Jesus, for each other, and for the poor. Every holy hour deepens our union with Him and bears much fruit. Nowhere on earth are we more welcomed or loved than by Jesus in Eucharist. When you look at the crucifix, you understand how much Jesus loved you. When you look at the Sacred Host you understand how much Jesus loves you now. This is why we need Perpetual Eucharistic Adoration in every Parish throughout the entire World. What will convert America and save the world? My answer is prayer. What we need is for every parish to come before Jesus in the Blessed Sacrament in Holy Hours of prayer. On the Cross Jesus said ‘I thirst’. From the Blessed Sacrament Jesus continues to say to each of us ‘I thirst’. He thirsts for our personal love, our intimacy, our union with Him in the Blessed Sacrament. When the Sisters are exhausted, up to their eyes in work; when all seems to go awry, they spend an hour in prayer before the Blessed Sacrament. This practice has never failed to bear fruit: they experience peace and strength. If you are looking for vocations, as a community have adoration every day. Once the Missionaries of Charity started daily adoration, their vocations doubled. I know I would not be able to work one week if it were not for that continual force coming from Jesus in the Blessed Sacrament (during my Holy Hour of Adoration). To be alone with Jesus in adoration and intimate union with Him is the Greatest Gift of Love - the tender love of Our Father in Heaven. Perpetual Eucharistic Adoration offers to our people the opportunity to join those in religious life to pray for the salvation of the world, souls everywhere and peace on earth. We cannot underestimate the power of prayer and the difference it will make in our world. Our hour of adoration will be special hours of reparation for sins, and intercession for the needs of the whole world, exposing the sin-sick and suffering humanity to the healing, sustaining and transforming rays of Jesus, radiating from the Eucharist. Each one of us is a co-worker of Christ - we must labor hard to carry Him to the hearts where He has not yet been known and loved...But, unless we have Jesus, we cannot give Him; that is why we need the Eucharist. 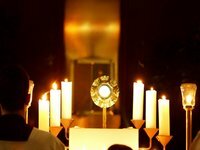 Spend as much time as possible in front of the Blessed Sacrament and He will fill you with His strength and His power. Perpetual adoration is the most beautiful thing you could ever think of doing. People are hungry for God. Imagine for a moment that we are living in Jesus’ time and He has invited us to visit with Him and spend some quiet time getting to know Him better. Being aware who He was, we would be humbled and honored by such an invitation. The good news is that Jesus is here with us TODAY - body, blood, soul and divinity – in the Holy Eucharist. Although Jesus comes to us under the appearance of bread and wine, His presence is as real to us NOW as He was flesh-and-blood-real to His disciples when he walked this earth. He can perform miracles, heal us, teach us, and love us. We can talk to Him and He can speak to us through His Word and through the Holy Spirit who lives in us through our baptism and confirmation. Jeremy Driscoll: The center of eucharistic spirituality is found, of course, in the communal celebration itself; but private prayer and adoration of the blessed sacrament are an excellent means of personally digesting the immense riches of the actual celebration. Adoration of Christ in the Blessed Sacrament is always to be understood as deriving from the presence of Christ in the actual celebration of the eucharist; adoration is meant to bring us again to the celebration of the eucharist with greater fervor and understanding. So, adoration begins in the celebration of Mass itself. However, in the Mass adoration is primarily to God the Father. It is adoration in “spirit and truth” (John 4:23), that is, adoration of the Father through Christ, the Truth and in the Holy Spirit. As tradition and teaching of the Church, in p. 237. The center of eucharistic spirituality is found, of course, in the communal celebration itself; but private prayer and adoration of the blessed sacrament are an excellent means of personally digesting the immense riches of the actual celebration. 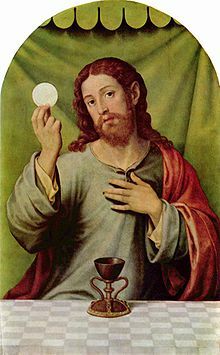 The whole form of the eucharistic rite is thoroughly trinitarian in its structure. It is by moving within this structure in faith and with loving adoration that the mind learns to bear the blinding light of the divine revelation. Glyn Richards:Radha was an ordinary village belle (gopi), but such was the passion and intensity of her love and devotion to the Lord that she has come to occupy a position of unrivaled to adoration in the Hindu pantheon. Mukul Goel:[In Hinduism] numerous devotional practices exist. Besides chanting God’s name with faith and satsang, the classical nine kinds of devotion listed in the Ramacharitamanas include adoration of God’s legends. Radha was an ordinary village belle (gopi), but such was the passion and intensity of her love and devotion to the Lord that she has come to occupy a position of unrivaled to adoration in the Hindu pantheon. Hiro G. Badlani, in "Hinduism: Path of the Ancient Wisdom (30 September 2008)", p. 149. A Hindu is instructed to walk the last phase of his stay in single file; he might look within, meditate, and search for the divine. It is only in the solitude aloneness (sanya) that an individual might experience Brahman, the immanent, transcendental God. Thus, established in the higher levels of divine consciousness, sanyasin is beyond both adoration and censure. [In Hinduism] numerous devotional practices exist. Besides chanting God’s name with faith and satsang, the classical nine kinds of devotion listed in the Ramacharitamanas include adoration of God’s legends. Mukul Goel, in Devotional Hinduism: Creating Impressions for God (20 April 2008), p. 22. The learned Brahmin attempts to prove the impossibility of an adoration of the Deity, saying … that which cannot be considered, cannot be worshipped. Should the learned Brahmin consider a full conception of the nature, essence, or qualities of the Supreme Being, or a physical picture truly representing the Almighty power, with offerings of flowers, leaves, viands, as essential to adoration, I agree with the learned Brahmin with respect to the impossibility of the worship of God. Glyn Richards, in Source Book Modern Hinduism (1 February 2013), p. 7. By Generally, the words worship, prayer, adoration and devotion are used in the same sense. Considering their meanings in the literal sense, they may be explained in the literal sense, they may be explained differently but the hidden meaning is the same for all these words. These words express the feeling of submission towards our deity. Adoration of our deity is such a mental process of exercise which has to be performed calmly and quietly, sitting in solitude, wherein our emotions, our trust and immersion is the prime factor. In fact, adoration is purely based on the strong determination and faith of the devotee. To express the strongest feelings for our deity, we externally offer various worship materials as gifts to the deity. Such offerings made are accepted by Him according to the feelings of the devotee. Shanicharananuragi 'datti' Madan Maharaj Rajasthani, in Effectuation of Shani Adoration, p. 295. ...should adoration imply only the elevation of the mind to the conviction of the existence of the Omnipresent Deity, as testified by His Wise and wonderful works, and continual contemplation of His power as so displayed, together with a constant sense of the gratitude which we naturally owe Him, for our existence, sensation, and comfort – I never will hesitate to assert, that His adoration, is not only possible, and practicable, but even incumbent upon every rational creature. Glyn Richards, in "Source Book Modern Hinduism (1 February 2013)", p. 7. Adoration of the Divine at all times is the principal activity of a true devotee. Vishnupurana, in Hinduism: Path of the Ancient Wisdom (30 September 2008), p. 350. Vivekananda prioritized the adoration of an impersonal Brahman over bhakthi-centred, anthroporpic worship. In The Indispensable Vivekananda: An Anthology for Our Times 2006, p. 7. 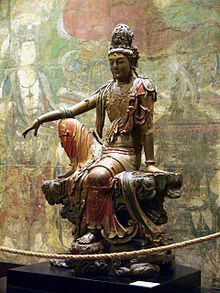 Avalokitesvara Bodhisattva - Though it, Divyavadna (the Heavenly Avadanas), begins with a Mahayanistic benediction, “Om, adoration to all the Buddhas and Bodhisattvas." The first step of adoration of Buddha is shown in the formula of “Adoration to Buddha (nama....sambuddhassa). Ujitani Uken, in Indian Buddhism: A Survey with Bibliographical Notes (1980), p. 84. Buddha became an object of adoration and also meditation. The term “buddhanusmriti” in early Buddhists scriptures had four meanings: (1)meditation on the virtues of Buddha; (2) hearing the name of Buddha; (3) repetition of the name of Budddha; and (4) meditation in the figure of Buddha. Rydoon Yoshiyoka, in "Indian Buddhism: A Survey with Bibliographical Notes (1980)", p. 84. Two inscriptions found in Greco-Bactrian Cursive Script found in Afghanistan mention the Buddhist formula of Adoration (namas) to Buddha. Hajime Nakamura, in "Indian Buddhism: A Survey with Bibliographical Notes (1980)", p. 115. Though it, Divyavadna (the Heavenly Avadanas), begins with a Mahayanistic benediction, “Om, adoration to all the Buddhas and Bodhisattvas." autonomous, and free from defilements. Every thought issues from the Mind. In Page 10, in the 10 lines of daily prayer, 'Yemmei' means "prolonging life" and 'Kwannon' means "relating to health". essentially as the creation of absolute Mind. Parasnath, a mountain in Bihar of great sanctity; it is the eastern, as Mount Abu is the western metropolis of Jain worship and pilgrimage. The most satisfactory way [in Jainism], perhaps, at arriving any conclusion is to divide the subject of prayer into various elements, such as petition, intercession, adoration, thanksgiving and to note under each head the actual practice and the sometimes conflicting opinions of the Jains. Subodh Kapoor (2002), in Indian Encyclopaedia, Volume 1. p. 5790. Parasnath, a mountain in Bihar of great sanctity; it is the eastern, as Mount Abu is the western metropolis of Jain worship and pilgrimage. 10,000, annually, from distant parts of India, visit the scene of Nirvana or beatific annihilation of the ten of the 24 deified saints or Thirthankars, who are the objects of Jain adoration; and from the last of these, Parswa or Parswanatha, the hill originally called samet Sikhar took its better known name as Parasnath. Subodh Kapoor (2002), in "Indian Encyclopaedia, Volume 1". p. 5499. The whole mountain is covered with other shrines which the pilgrim, at some risk to life and limb, must visit. The rite is followed by adoration at the temple of Parsvanatha, and by the circuit (pradadsina) of the holy site, involving a journey of about 10 km. Bhaava Pujaa, “Psychic worship (Bhaava Pujaa) consists of a series of rituals, for temple veneration, which is called Caitya vandana. In this worship hymns of praise, adoration and devotion are recited together with the performace of penance and meditation. Natubhai Shah (2004), Jainism: The World of Conquerors, Volume 1, p. 179. In Islam the Prophetic tradition or Sunnah which can also be called as Tao of Islam, literally meaning Way to Divine Submission, includes abundance of solitude, contemplation and adoration of the Divine. Spiritual foundation consists of the practice of solitude, contemplation and adoration. While this is true for every single religious tradition, but often we see from reality that this foundation gets ignored and undernourished. In "The Practice of Solitude in Islamic Tradition". The 'Adoration' of God is indeed the greatest love of all. The love of God is the noble driving force behind worshipping Him, upholding His Law and working righteousness to please Him. Those who are true believers love God the most. Others, and to varying degrees, have set up idols whom they love equally if not more than God. The Quran is very clear in stating that we are not to love any one as we should love God. It is indeed the duty of every believer to love his brethren and be tolerant. Moreover, God has created for us our partners with whom we share love and affection (Sura 30, verse 21), yet all this love should always be exercised within its proper context. No matter how much we may love our children, our partners, or indeed God's prophets whom He sent with guidance; we should never love them as our love of God. Only the love of God is worthy of being elevated to the state of adoration. There is a very thin line between love and adoration. Quran, in "The Concept of 'Worship' (Al-Ebadah) A Quranic perspective: Act Three: Adoration and Veneration". Dr. Liyakat Takim:The most famous Sufi form of adoration is a mystical exercise called dhikr. This refers to the systematic repetition of God’s names so as to attain continuous awareness of God’s presence. ...for the Sufis, we are actually spiritual beings who are undergoing a transient human experience. It is in this context that we can comprehend the Sufi quest to experience God in the present world, to feel His majestic presence and to remove that separate human from the divine. This mystical quest precipitated the concept of adoring God. Adoration of God, in Islamic mysticism takes many forms. These range from various forms of ascetic exercises, self-mortification, vigils, protracted prayers, meditation to emulating the spiritual exercises of the Prophet Muhammad. Dr. Liyakat Takim, in Adoration in Islamic Mystical tradition, pp.2-3. The most famous Sufi form of adoration is a mystical exercise called dhikr. This refers to the systematic repetition of God’s names so as to attain continuous awareness of God’s presence. Dr. Liyakat Takim, in "Adoration in Islamic Mystical tradition", p. 3. The Sufi adoration of God is also expressed by the salat (ritual prayer), which is in fact, the second pillar of Islam… Prayer is seen as an intimate conversation between the human and the Divine....Rumi’s view, absorption in the Divine Unity is the soul of prayer. 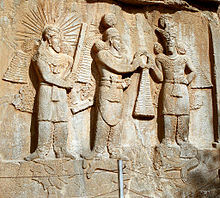 Investiture of Sassanid emperor Shapur II (center) with Mithra (left) and Ahura Mazda (right) at Taq-e Bostan, Iran. Zorashtrianism is also known as Mazdaism from the name of the Supreme god, Ahura Mazda, and as Magism from the name of its ancient priests, the magi. The Three Wise Men of the Bible are believed to have been Zoroastrian magi, hence the Adoration of the Magi. One has to view the attitude of the Zorashtrian community towards this sacred symbol [fire-worship] side by side with its adoration of other sacred elements. Rustam Masani, in Zoroastrianism: The Religion of the Good Life (1938), p. 86. Zarathushtra denounced all forms of cruelty, destruction, and hypocrisy. Ahura Mazda was said to create only good and should be worshipped by good thoughts and good deeds only. Adoration was showed to “the supreme” by rhythmic verses called Gathas. Zorashtrianism, in Iran 15 September Zorashtrianism (2010), p. 261. Al-Maqdisi, in Muslim Perceptions of Other Religions : A Historical Survey: A Historical Survey 19 August 1999, p. 205. Zorashter explained that these other entities (apart from Ahura Mazda] were special gods but special beings created by Ahura Mazda to assist humankind and aid in the battle against evil. He called these beings, which he claimed were still worthy of human adoration, yazatas (which, appropriately enough, means “worthy of adoration”). In The Mythology of Supernatural: The Signs and Symbols Behind the Popular TV Show (2 August 2011), p. 131.
shall be full adoration of Thy Glory. yazatas, 48.1, quoted by Paula Hartz (2009), in Zoroastrianism, p. 15. 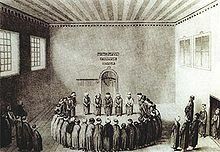 The chief liturgy of the Zorashtrians is the Yasna, a term that literally means “sacrifice” (corresponding to the Sanskrit term yajna), and includes confession, invocation, prayer, exhortation, praise, worship, adoration, and offerings. Solomon Alexander Nigosian (1993), in The Zoroastrian Faith: Tradition and Modern Research, p. 49. This page was last edited on 30 January 2019, at 20:43.